Terminating the end of an optical fiber, the fiber optic connector is utilized to join optical fibers where a connect or disconnect capability is required. A optical fiber connector has three major components: the ferrule, the connector body and the coupling mechanism. Generally made from ceramic, metal or high quality plastic, the ferrule is a thin structure (often cylindrical) that holds the glass fiber. The connector body is a plastic or metal structure that holds the ferrule and attaches to the jacket and strengthens members of the fiber cable itself. And the coupling mechanism is a part of the connector body that holds the connector in place when it gets attached to another device. Since the fiber cable transmits pulses of light instead of electrical signals, it is important to choose a good optical fiber connector that aligns microscopic glass fibers perfectly in order to allow for communication. Nowadays, there are many different types of fiber optic connectors in the market (as shown in the following figure). Different kinds of optical fiber cables may need different connectors. Seen from the types of optical fiber, the fiber optic connectors may be loosely classified into standard fiber optic connectors, small form factor fiber optic connectors and ribbon fiber connectors. These family types of fiber connectors sometimes may overlap with each other. Generally having a ferrule of 2.5 mm, standard fiber optic connectors are connectors commonly used in the fiber network. They can be both simplex and duplex and available in single mode and multi-mode fibers. ST, FC, SC, FDDI and ESCON are all standard fiber connectors. But they also differ from each other. ST connector is the most popular connector for multi-mode fiber optic LAN applications. FC connector is specifically designed for telecommunication applications and provides non-optical disconnect performance. SC connector is widely used in single mode applications for its excellent performance. FDDI connector, which is a duplex multi-mode connector, utilizes two 2.5mm ferrules and is designed to used in FDDI network. ESCON connectors are similar to FDDI connectors, but contain a retractable shroud instead of a fixed shroud. To meet the demand for devices that can fit into tight spaces and allow denser packing of connections, a number of small form factor fiber optic connectors have been developed since the 1990s. In this type of small form factor fiber optic connectors, some are miniaturized versions of older connectors, built around a 1.25mm ferrule rather than the 2.5mm ferrule. For example, the LC, MU, E2000 connectors. While the others are based on smaller versions of MT-type ferrule for multi-mode fiber connections, or other brand new designs. For example, the MT-RJ connector, which has a miniature two-fiber ferrule with two guide pins parallel to the fibers on the outside. Its overall size is about the same as an RJ45 connector. The optical fiber connector is an essential part of fiber optical network. As the popularity of fiber optical network, about 100 fiber optic connectors have been introduced to the market. 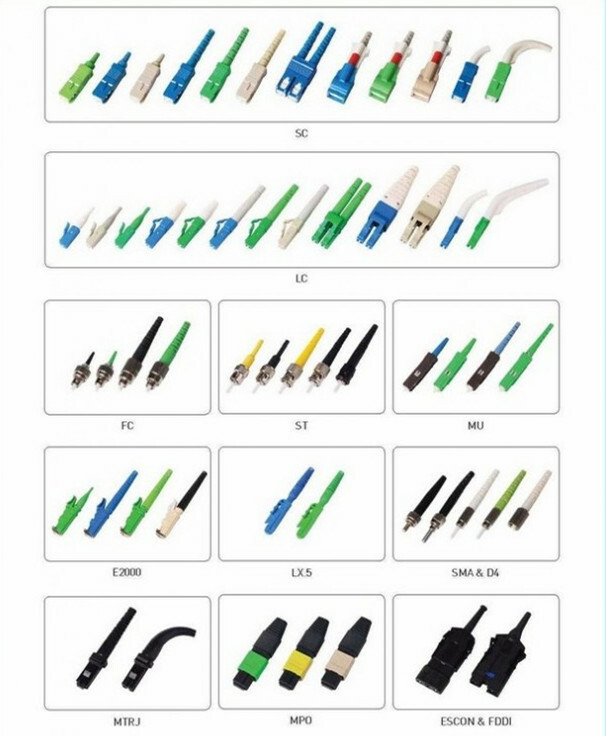 As the main professional fiber optic products supplier in China, Fiberstore offers various kinds of fiber cable connectors, especially the commonly used FC, LC, SC, ST and MPO connectors.